20 Questions with Pia Alonzo Wurtzbach, Miss Universe® 2015! Hey High 5-ers! Many of you may have watched Pia Alonzo Wurtzbach win the coveted crown during the 2015 Miss Universe Beauty Pageant, or followed her travels while playing Miss Universe ® Asian Adventures, but did you know Pia loves to bake red velvet flavored treats? 1. What is your 2017 New Year’s Resolution? – I always take other people’s opinions seriously and sometimes to a fault. Next year, I will listen to what makes ME happy and find the right balance. 2. Part of your duties as Miss Universe 2015 has been to travel the world, which city did you enjoy visiting the most? – It’s always good to be back home. Definitely the Philippines. 3. You’ve been participating in beauty pageants for many years, in which pageant did you receive your first win and how old were you? – The first pageant I joined was in 2013 for the national competition in the Philippines. I didn’t win that year but placed as the 1st runner up. For my first time participating, I think that’s pretty good! It was good practice for the 2015 Miss Universe competition. 4. As cooking is one of your favorite hobbies, what is your favorite dish to prepare? – I enjoy baking! My favorite recipe to make is red velvet anything! Also because it’s my favorite to eat too. Haha. 5. What is your guilty pleasure TV Show? – I don’t watch a lot of TV which is ironic because I am in front of the camera often. That said, I do enjoy a little Family Guy and Archer here and there. 6. If you could have any animal as a pet, what would you choose? – I have a long coat, black and white Chihuahua named Prada. She’s very friendly and she never barks at people. She is very sweet like her mommy. 7. As acting is a passion of yours, what actor or actress would you love to co-star with? – I enjoy working with anyone I can learn something from. 8. As Miss Universe 2015, you have met plenty of celebrities, did you get star struck meeting any of them? – For the first few months I was star struck with almost everyone I met. Living in New York City for a year and making celebrity appearances has made me more comfortable being in the spotlight. I feel very blessed. 9. You always look amazing in all of your photos, both professional and on social media. Any tips you have learned to take a good a selfie? – Lighting is your best friend. The right lighting will do wonders to your selfie. Not even a filter can beat good lighting. 10. For the past year you have been living in NYC, how much of an adjustment was it from living in the Philippines? – I live in the capital of the Philippines so I am used to the city life. I love the fast paced lifestyle of New York and I adapted to it quite easily. 11.What will you miss the most about living in New York? – The vibe. Just the feeling of being in New York is incomparable. It really is a city that never sleeps. I love it! 12. Filipino, English and German are three languages you speak, are there any more you would like to learn? – Mandarin! It is the language of the future. I’d love to learn it. 13. How excited are you to be able to crown the future Miss Universe 2016 in your home country? What piece of advice would you give her? – It’s a great way to end my reign! My advice for her – love your job. Don’t ever question your destiny. 14. Any advice for all of the women participating in Miss Universe 2016? – The competition is a journey. It’s not the beginning or the end of your personal and professional goals. That goes the same for the winner too. Being a part of Miss Universe is an experience and leaves you with a lifetime of memories. 15. The past year has been full of traveling and scheduled appearances, what are you looking forward to in your time off once Miss Universe 2016 is crowned? – I have missed seeing my family and friends more regularly. It will be great to catch up with them again, but I know I’ll be back to work right away which I don’t mind at all. 16. If you could give girls aspiring to be Miss Universe one day, a piece of advice what would it be? – Be careful what you wish for because dreams do come true! 17. This once and a lifetime experience is something you will remember forever, what has been your favorite part? – Being able to share my story to other people. It was a long journey finally having the title of Miss Universe. I hope I have inspired people to continue fighting for their dreams. 18. What is your inspiration for doing your best each and every day? – My family. I look at them and I’m reminded on why I do what I do. Because I want to continue to provide and help them as best as I can. I can’t help it. Filipinos are very family oriented. 19. We recently released a new game Miss Universe ® Asian Adventures. What was your favorite part about working on this project with us at High 5 Games? – I am excited that I have the opportunity to be the star in the game! I can’t wait to play it and share with all my friends. 20. There are 5 destinations featured in Miss Universe ® Asian Adventures; besides your home country of the Philippines, have you been to the remaining four, Japan, China, Hong Kong, and Thailand, in person? – I have. I think that’s why I was able to embrace the characters and destinations with ease because I’ve visited them myself before. So what do you think High 5-ers? Are you planning on watching the pageant to see who takes the 2016 crown? Do you have anything in common with Pia? Comment in the conversation bubble located on the top right corner of your screen and let us know! To see what channel and time the pageant is airing near you, check your local TV listings, and don’t forget to play Miss Universe® Asian Adventures and Miss Universe® Crowning Moment on High 5 Casino! With January underway, we are so happy to jump into 2017 with our loyal Shake The Sky players! During the holiday season we hope you got to spend some quality time with your loved ones, enjoy the company of each other and have some time to relax and play your favorite STS slot. Throughout the month of December, STS-er’s, sure won big! 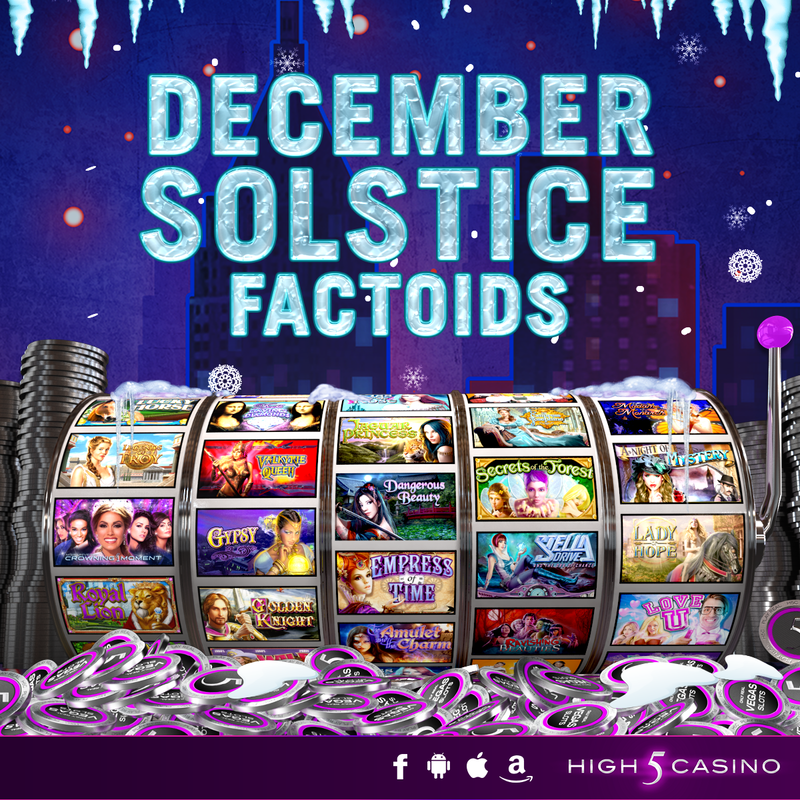 We tallied up the numbers and a total of 37,529,825,297,150 coins were won in December! Could you imagine winning that much money in real life? Check out some more December Stats below! 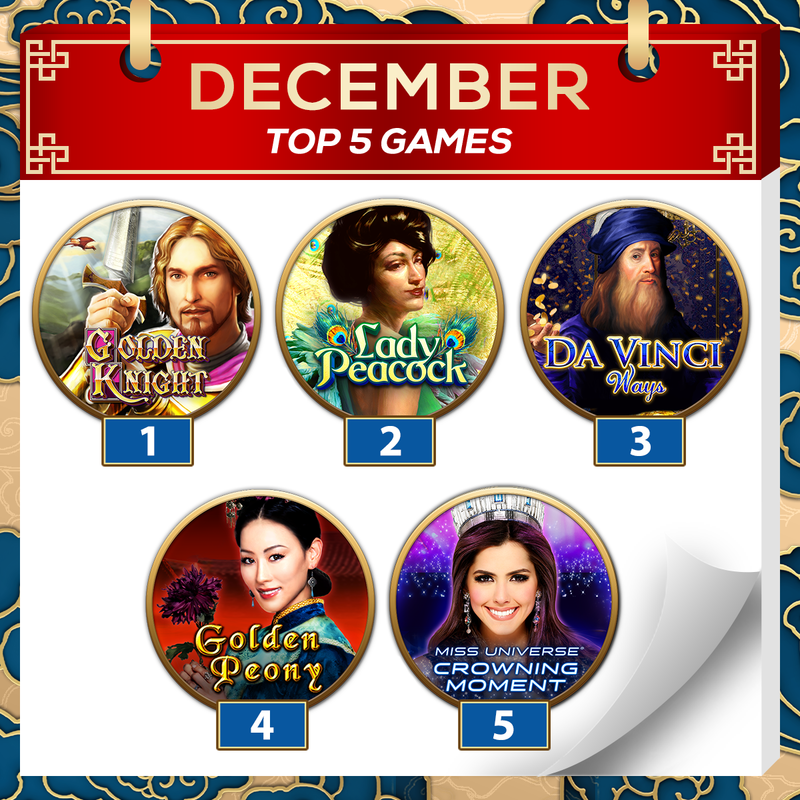 Top 5 most played games for December: Golden Knight, Lady Peacock, Da Vinci Ways, Golden Peony, Miss Universe Crowning Moment. Which game did spend the most time playing in December? Comment in the conversation bubble located on the top right of the blog post to let us know! Shake the Sky November Stats! Happy December STS-ers! Is it just us or did November fly by? STS-ers were busy this month giving the Shake the Sky reels lots of special attention by spending a total of 207,521 hours playing! Top 5 most played games for November: Golden Knight, Lady Peacock, Dangerous Beauty, Golden Peony and Da Vinci Ways! Which game did spend the most time playing in November? Comment in the conversation bubble located on the top right of the blog post to let us know! 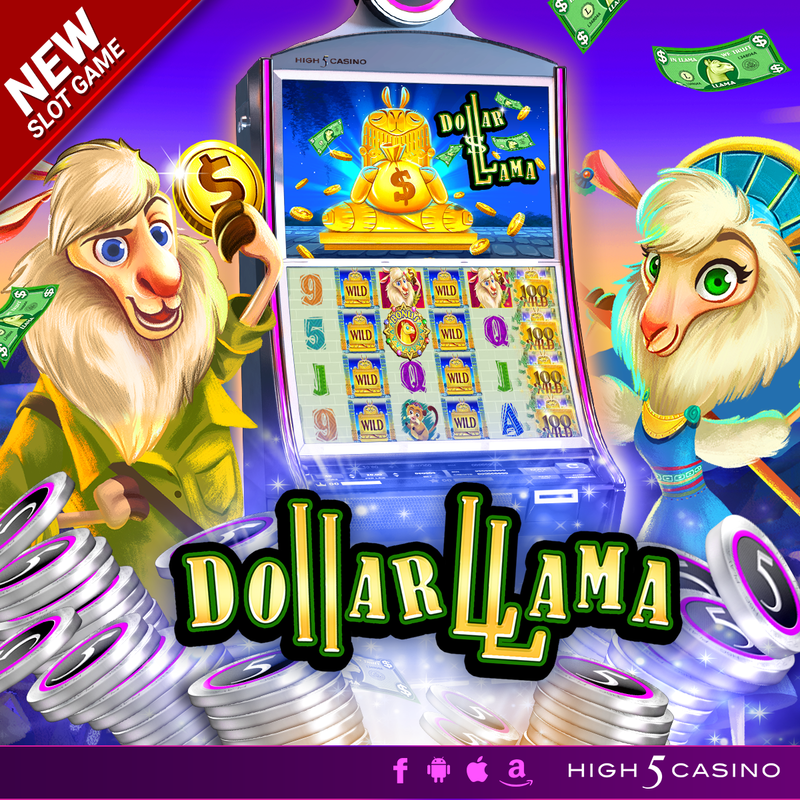 Did you know High 5 Games not only produces online casino slot games but we produce land based casino slot games as well? 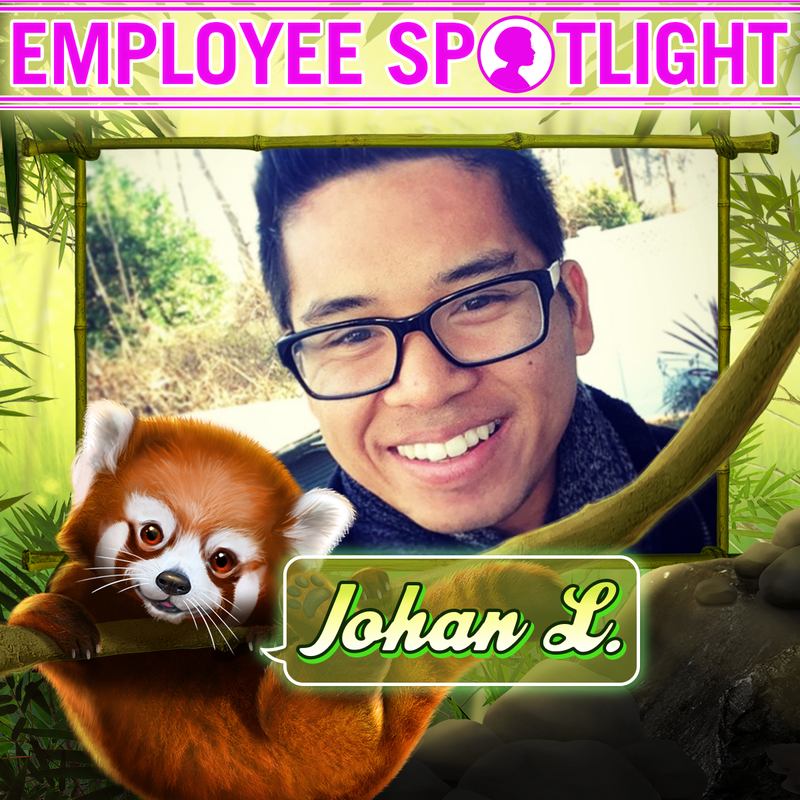 Meet Johan L. Sr. Production Artist who leads one of High 5 Games most brilliant teams in producing the illustrations for our amazing land based slot cabinets such as: Miss Universe: Crowning Moment, Valkyrie Queen, Maggie and the Martians and so much more! 1. How long have you been working with High 5 Games? I have been working with High 5 Games for 7 years now. I was around the 35th employee, and a few years later, the company grew up to 300! 2. Please tell us what you do, as Sr. Production Artist for High 5 Games? I mainly do illustration work for land based games in our post production team. But I can do a little bit of animation as well. Production Artists are mixed with Art and technical skills so we can do a little bit of code editing as well. 3. Name the game you are most proud of working on for High 5 Casino and tell us why it’s your favorite and what inspired you? Our team doesn’t really work on High 5 Casino, but one of my favorite games I worked on for land was Miss Universe: Crowning Moment. Doing the top screen was fun and colorful and I got to meet Miss Universe! On a side note, there is a game my team is working currently for mobile, look out for MAGIC MACAW! 4. How long does it take to create and complete the animations and illustrations for a game? Can you tell us what goes into it? Once a game is bought by our land based client, ideally we have around 2 to 3 months to do the final illustrations, animations, prototyping and packaging. 5. 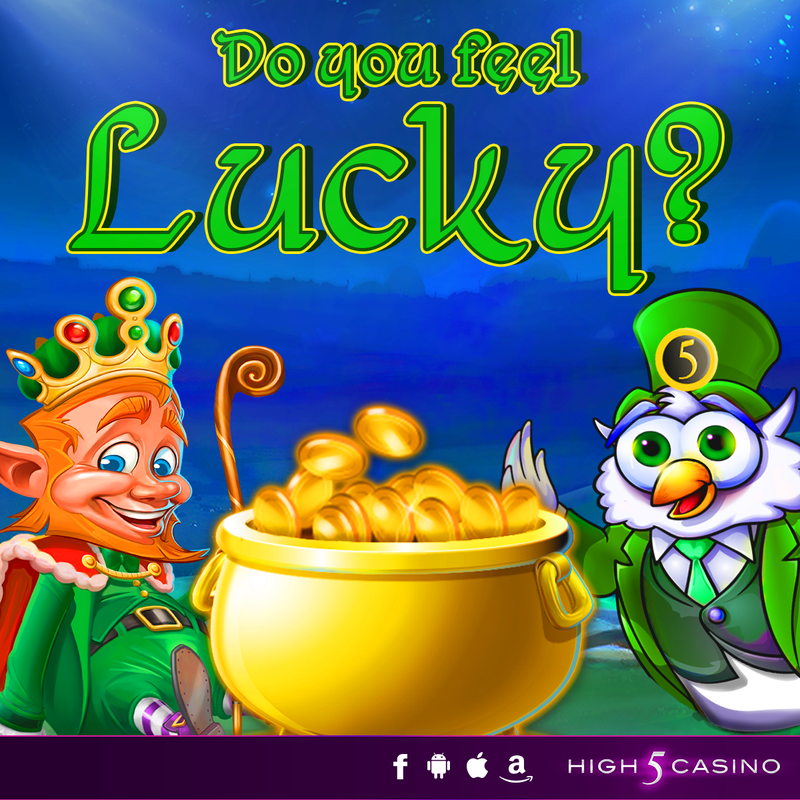 If you could be a High 5 Casino game character who would you like to be? Why? 6. What is the hardest part when creating the animation and illustrations for a new game? The hardest part for is always the concept sketches and color. But once that’s finalized, the details are easy. 7. What is your favorite animation to create? I don’t specialize in animation, but once in a while I get to do simple ones like sparkles and text wiggling! 8. How did you get involved in animation and illustration? During high school, I wasn’t sure what I wanted to study but all I knew is I loved art class. So my art teacher suggested School of Visual Arts, and that’s where I studied illustration and I loved it! 9. If you weren’t an artist, what other profession would you have chosen? A few years after graduating college, I stumbled into my 5th grade year book and underneath my photo we were asked “what do you want to be when you grow up?” and I wrote Engineer. Guess that was my original plan and I just forgot. Haha! 10. 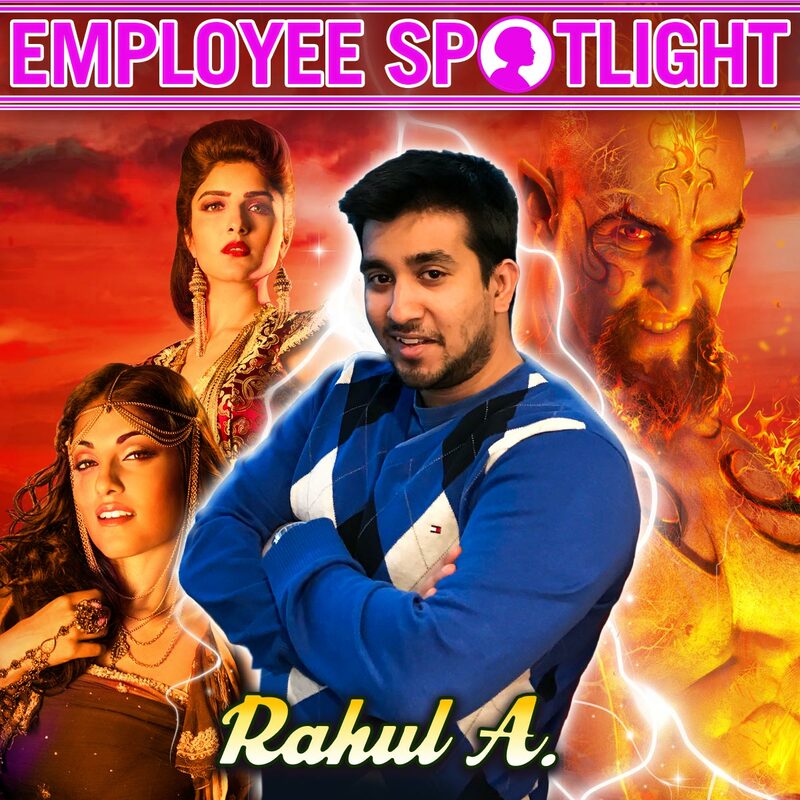 As Sr. Production Artist, what is your favorite part of your job? Doing art is the obvious answer, but having the privilege to work with friendly, kind, and fun group of people is my favorite part. My commute is 2 hours each way which is torture, but once I get to work, I realize how fun my job is. 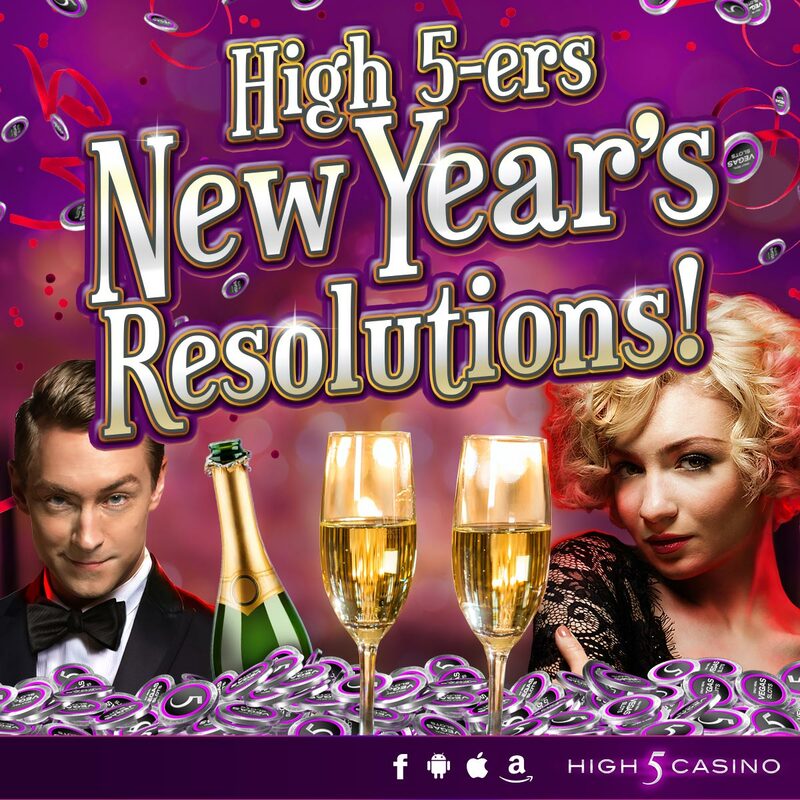 Which High 5 Games’ game have you seen in your local casino? Comment in the conversation bubble located on the top right of the blog post to let us know!